If you’re super jazzed about the holidays (you know we are), you’ve probably got your seasonal schedule all mapped out. Well, it’s time to step away from the gingerbread house Pinterest board because we’ve got a tasty treat for you! To help you get a jump-start on Christmas list crossing, we're running a Holiday Payout Bonus! From November 1 - November 16, 2018 at 2 am PST, we’re increasing our payout bonus rates. 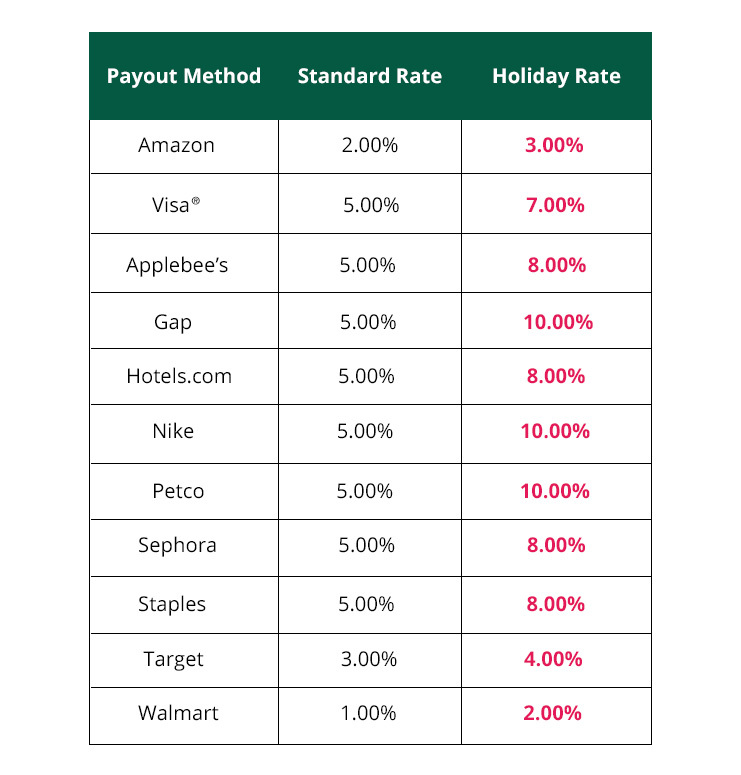 That means if you choose to withdraw your TopCashback earnings through any of the options below, you will receive a higher rate than normal! So hurry and cash out your funds to take advantage of the bonus dough. It's sure to come in handy for those early access Black Friday sales. Check your account balance here for bonus opportunities! The Visa Prepaid Card is issued by The Bancorp Bank, Member FDIC, pursuant to a license from Visa U.S.A. Inc. and can be used everywhere Visa debit cards are accepted around the world. I'm looking to redeem my Payable amount to get the bonuses but on the Payments page, it shows the normal bonus, not the holiday bonus. What's going on? Hi, how long is the Visa card valid? Can you help retrieve it please? I'm new what am I suppose to do? You can read more on how to get started through the link below. This is more for when you have payable cashback in your account. You can read more on how to earn cashback through the link below. If you choose a Gap Gift Card then you'll receive 10% Top up on your payout. I can see at the moment we have 1% Cashback on toys for Walmart on our site. I'm new, i've never used this app before, i'm super excited but need help to understand exactly (correctly) to use this site. Please and thank you!! We have tips and explanations of how TopCashback works in our help section and getting started page you might find useful. On the 'Payout' page Target is currently showing 3%, Not 4%. It may have been that cache needed a little time to update on your computer but this is now showing the higher rate of 4%.